Wisdom of Life. : Daughter in law stole my son. Hey there! Are you having grown up children who are married? Be careful! If you cannot get along with the "in-laws" you stand a chance to loose the sons & the daughters. Madam Chan has two sons who used to love their mother so much. She was a proud mum, when all relatives were so envy on her because her sons not only were intelligence, they were obedient and caring for the widow parent. Their mother's interest was always first and important, and without the mum's decision on any matters, the sons would be patience to wait. The family of three were happily united, until they got married. Alas! Things changed when two extra females came into their homes. The new ladies of the house equally love these two nice sons, or i should say they love them even more. Mother could only love them from the outside, whereas the other women gave their entire souls and bodies to the husbands. 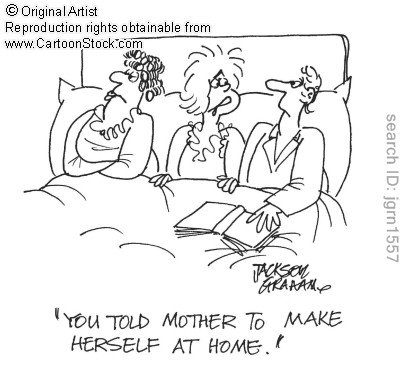 Mother became possessive when emotional love turned more to jealous and anger. Soon the three women of the once warm home became cold and violent. They quarrelled, argued and showed temper. To make matters worst, the sons stood on the wives' sides, hurting the old lady beyond doubts. Soon the family was breaking apart without a solution, when the sons and wives left their old home. The aging mother was left alone to fence for herself. The most happiest mum at one time has broken her heart today. Reason... The daughters in law have stolen her good sons away. This is true fact of life and to avoid such unnecessary problems, learn to love your future in-laws. I have two ex-daughters in law and two current daughters in law who love me so much because i never in the first place behaved like a father in law ever since i knew them. I treat them like my best friends when i joke and have laughter all the time and i love them more than their own parents. Yes! These ladies have taken my sons from me, but they haven't taken away my love away from my sons. Haha!!! I like these two quotes - "Behind every successful man stands a surprised mother-in-law" (Hubert Humphrey) & "The difference between in-laws and outlaws is...outlaws are wanted!" I am glad you like my sharing. Your compliment spurs me to write better. Thank you for reading my blog. May i have your name and country you are from? Start to see the Appendix for the applicable provisions from the law, Section 709(c) of Title VII, and also the applicable regulations, Sections 1602.7-1602.14, Chapter XIV, Title 29 with the Code of Federal Regulations. State and local governments, school systems and academic institutions are addressed by other employment surveys and therefore are excluded from Standard Form 100, Employer Information Report EEO-1.